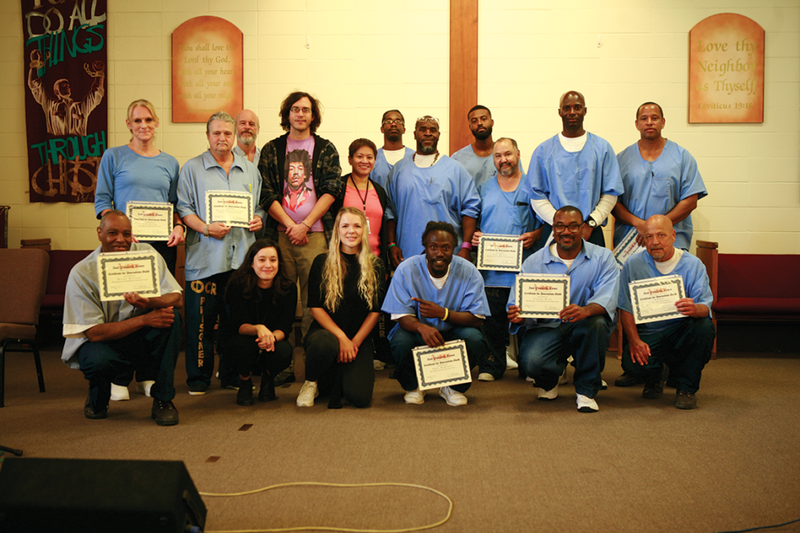 The Journalism Guild of San Quentin held its first formal graduation in the prison’s Garden Chapel in late September. More than 50 people attended the ceremony, including current and former students from UC Berkeley, who worked with the men in the Guild and San Quentin News. She was also the keynote speaker. She also spoke of Marcus Henderson, the Journalism Guild chairman. “I couldn’t have done any of this without him,” she said. Henderson opened the ceremony by giving a brief history of the Guild and its connection to San Quentin News as its farm team of writers that have contributed more than 160 stories to the newspaper this year. “The Journalism Guild is the centerpiece to San Quentin News,” Richardson said. He acknowledged education instructor Don Pino as the first Guild sponsor. He thanked the U.C. Berkeley students and said the Guild’s dedication is what keeps him going. “You’re representing millions of inmates around the U.S,” he said. Richardson said the men walk into the Guild to become better journalists, but they leave as better human beings. Lt. Sam Robinson talked about all the work the news- paper has done and reflected on the first time he, former Warden Robert Ayers, advisers John Eagan, Joan Lisetor, Steve McNamara, and former editor-in-chief Michael Harris met in the chapel to discuss restarting the newspaper 10 years ago. “San Quentin News is beyond the walls of this prison,” Robinson said. “Your voice is the voice of millions of people.” He also discussed the “short timers,” News staffers who’ve been found suitable for release by the Board of Parole Hearings, and others who’ve received commutation of their sentence by Governor Brown. “I don’t look to them anymore. I look to you,” he said of the Guild writers and other News staff who will run the paper in the future. “Writing is about character and having a diversity of voices to be heard on paper,” said Lisa Strawn, a transgender who delivered one of the most convincing speeches of the day. “When I write, it tells the character of my soul.” She thanked Henderson for asking her to speak. Strawn said writing is easy. It was simple to tell about her life and the lives of others, and sitting in front of Kane for 26 weeks has been one of the highlights of her 24 years in prison. Henderson gave certificates of appreciation to all the U.C. Berkeley students. “They’ll always be in our heart,” he said. Clausen said she learned about the uniqueness of San Quentin having so many programs and opportunities for the men to rehabilitate themselves, unlike many other California prisons. “I hope someday San Quentin will have competition,” she said. “I thought it was really wonderful to usher in a new group of talented people,” said Kate Wolffe, a recent UC Berkeley graduate. She said the News has a great legacy and the first official Guild graduation ceremony holds a lot of weight, and she hopes others will consider joining to try their hands at journalism. “When I first came in (prison), all I had was my past, with no future,” said Jesse Vasquez, who’s been with the News for one year. He said everything is embedded in the narrative, and for many inmates their narratives are casualties. He said his reason for sticking with the Guild was to be able to tell a better story because every inmate has something to say. He since has had an article published in the Washington Post.